It's a little known fact, but Ralph Nader is seriously interested in sports, which is why he believes there should be a Bill of Rights just for the fans. 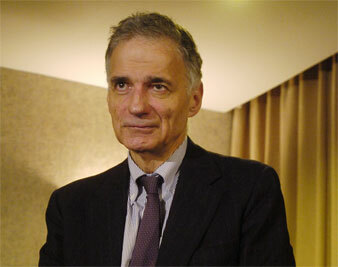 Ralph Nader is best known as a legendary consumer advocate, a person who has touched virtually every aspect of our lives from car safety to the quality of our food. He’s also a notable thorn in the side of Democratic Party activists desperate to win a presidential election and flummoxed by his quadrennial candidacy. However, few people know that Nader is also an avid sports fan. He was responsible for the launching of the League of Fans, a sports reform project, and he has also passionately pushed for a “Bill of Rights” for the American sports fan. In addition, he has recently made the sports pages by raising serious criticisms of NBA referees–assertions he has made for years that are finally being taken seriously in the wake of statements made by disgraced former referee Tim Donaghy. When did you become a sports fan? I was really taken by Lou Gehrig when I was a little boy because of his demeanor and his stamina. Remember, he played in over 2,000 consecutive games at that time, which was since eclipsed by Cal Ripken. But you know how everyone has a sports hero when they’re a boy? This one really stayed with me. The concept of stamina and persistence. And it turned me into a Yankees fan. Persistence is a word that a lot of people associate with you in your public life. Is Gehrig an inspiration in this regard? Oh, most definitely. There’s only one picture in my office on the wall, only one: Lou Gehrig. When did you realize that League of Fans was a project you wanted to be involved in? Well, actually there’s a precursor. We had a fans’ group in the 1970s that put out a very probing newsletter. The idea then was how fans are being ripped off; they had no voice; they had no organized role. They were being overcharged. They were being subjected to blackouts in their hometown for example, if the stadium didn’t sell out. This was also the beginning of a move for tax-funded stadiums and ballparks. There were really quite a lot of issues. We had 1,000 dues-paying members, but we couldn’t get it beyond that. But my desire was to have fans organize–because after all, they’re consumers. They’re consumers at the service of mammoth sports enterprises that have antitrust exemptions, that have all sorts of tax-depreciating rights for their players. I mean, it’s almost a mint to produce money. They gouged the fans as consumers; parking, food, tickets, and they gouged them as taxpayers too. So it was really a composite situation that is replayed throughout the economy between large corporations and consumers. Since, as sports fans, we’re very, very clever and understanding of the rules of the game, the strategies and the players, and…know the history of the players and teams and [are] loyal to the teams, I said, “Imagine if voters did their homework, and imagine if voters had that kind of tactical and strategic sense. Imagine voters who rooted for rookies–if voters wanted to give new candidates a chance to play on the field. So we started leagueoffans.org, and once again we came up with all kinds of needs to organize fans–especially to oppose tax-funded stadiums while clinics, libraries and schools were crumbling the the same cities for lack of public investment. Yeah, there was over $600 million dollars spent to build the new Washington Nationals’ baseball stadium, but if you look around Washington, DC, you see schools crumbling, clinics–the usual urban deterioration. And not enough recreational facilities for youngsters so they can engage in participatory sports, not just spectator sports. That’s one thing that sticks in my craw too: the sports industry loves to create passive consumers, when in theory, sports is about active participation. That’s why the sports pages in the newspaper should be called the spectator sports pages. Because they don’t cover participatory sports: amateur sports, amateur leagues, what’s going on at the local playgrounds or any effort to promote activity and competition. Presidential candidates frequently talk of a “patients’ bill of rights” or “passengers’ bill of rights.” What would a fans’ bill of rights include? What items would you include in relation to this often abusive relationship between sports owners and fans? Like [the former home of the Houston Astros] “Enron Field”? Yeah, right! But more important than that, there should be organized fans’ groups that can sit at the table. Anything that intersects public policy with the sports teams, the fans have got to have representatives at the table. Yankee Stadium is now going to be demolished. Imagine demolishing Carnegie Hall! The new Yankee Stadium is going to be built with heavy–not total–taxpayer money, although the Yankees want another $ 350 million in tax-free bonds to be issued, and the mayor is apparently supporting that. Anyway, they took over a twenty-acre park, a very important park in the neighborhood, with beautiful trees. The trees have all been cut down and the stadium is going to be built in that park. The residents were promised four or five little parks in the neighborhood that would be refurbished. Well, now there’s a two-year delay, and it’s not clear that there’s enough money, that the city has enough money to do it. There’s enough money to build the stadium; that part of the deal was secure, but not the trade-off. The fans and the neighborhood were never there. The fans were never consulted and the taxpayers were never consulted. So a fans’ bill of rights really means that there are players at the table. If the food and tickets and parking are going sky-high, the fans should be in on this. The moment a tax dollar touches a stadium, the fans, the taxpayers, the neighborhood, they’ve got to be given a voice; and that includes the right to take the city and the sports team to court intending to sue. You’ve actually been in the sports pages a lot recently in regard to a 2002 playoff game between the Sacramento Kings and the Los Angeles Lakers. Something occurred during the game that really troubled you. What was it? The worst performance by referees I’ve ever seen! The Kings were up three to one–here’s this upstart, small-market team against the giant Lakers big-market, Lakers were favored three-to-one. They were in the sixth game, they could have won the championship. The referees called something like twenty-seven fouls in the fourth quarter against the Sacramento Kings and didn’t call fouls–egregious fouls–against the Lakers. For example, Kobe Bryant elbowed Mike Bibby in the face, Bibby fell, was bleeding, went to the sidelines. Everyone saw it; no foul against Kobe. So the suspicion arose of the referees being company referees–after all, they were selected by David Stern, the commissioner of the NBA to officiate in the playoff games. Basically, it was really good for the league financially to throw it into the seventh game. Well, the seventh game went to the Lakers, and the Lakers won the championship. Now, nobody could prove this–there was no directive, no secret e-mail, no wink by David Stern. There didn’t have to be. So is it just a case of massive, sudden incompetence, that favored one team, or is it something else to earn more revenue for the league by throwing it into the seventh game? Well, maybe we’ll never know, but it was massive incompetence. Why didn’t David Stern–who I spoke to on the phone after I sent him this objecting letter… he’s cordial but very imperious if you can believe the combination. He spoke like he was head of a corporate dictatorship. The NBA is a corporate dictatorship. Once the contracts, however lucrative, are signed with the players it’s dictatorship-land. There is a provision in the contracts with the players called the “antidisparagement provision” where they give up their free-speech rights. So if they complain publicly or criticize a referee or David Stern, they can be fined five-thousand, ten, fifty, a hundred thousand dollars! Mark Cuban, the owner of the Dallas Mavericks has already paid $1.5-plus million in fees, in penalties. Now, the government can’t fine you for free speech. Most corporations can’t fine you–they can fire you, but they can’t fine you if you speak your mind. So my recommendation is the following: I understand that it’s very disruptive while the teams are actually playing each other during the season to have people spouting off about managers, coaches, players against players and so on. But the antidisparagement clause should stop after the season, and there should be a free speech period in the off-season so that any potential cover-ups can be exposed. With all of the other problems in the world right now, why focus on the world of sports? There are much more serious problems affecting people in our country, in our community and in our world, to be sure. But people deserve a sanctuary where they can trust what’s going on is going to be based on the merits and not influence-peddling or shenanigans of various sorts, and that’s sports. One reason people are attracted to sports is because things happen on the merits. Teams win or lose on the merits of their players and coaches and managers. When that trust is betrayed, you can see that there’s a real letdown among the fans. It’s more than just a psychological letdown. It’s like, “Oh no! This stuff is happening here too? Where will it all end?” If we want to build trust, sports is a good place to do it. But with the commercialization of giant sports conglomerates, you’re not going to see that any time soon without strong fan organizations, like the League of Fans, to inspire around the country.